Use a 1 to 2-inch biscuit or round cookie cutter to core each pineapple round. Heat griddle or skillet over medium heat. Brush lightly with butter or oil. Cook pineapple rings 2 minutes. Sprinkle with brown sugar, then flip and cook another 2 minutes until caramelized. Transfer to a plate. Combine Bisquick™, milk, vegetable oil and eggs; stir until combined. 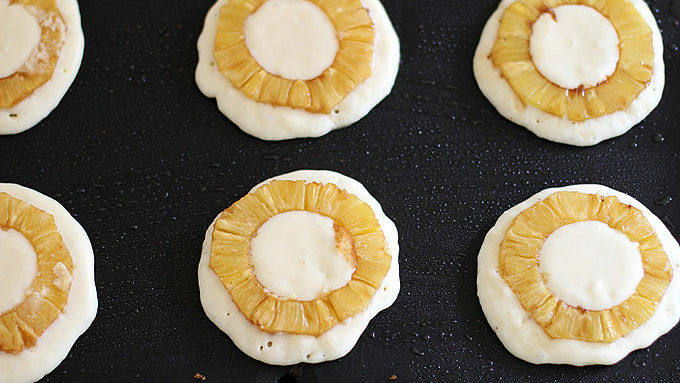 Pour 1/4-cupfuls batter onto hot griddle, then top each pancake with a pineapple ring. Cook 3 to 4 minutes until bubbles form on the surface and edges are dry; flip and cook another 2 minutes until cooked through. In a large bowl using an electric hand mixer or the bowl of a stand mixer fitted with the whisk attachment, whip heavy cream, powdered sugar and cinnamon on high speed until stiff peaks form. Top pancakes with maple syrup, whipped cream and maraschino cherries. 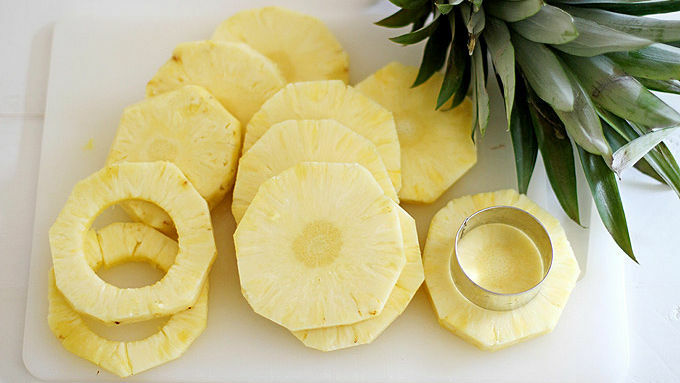 Instead of using a fresh pineapple, you can also use canned pineapple rings. Your favorite Pineapple Upside-Down Cake makes a comeback – as delicious pancakes! What a great way to wake up! There's no need to skip breakfast anymore to enjoy dessert. These pineapple upside-down pancakes make both possible. I don’t know about you, but I look forward to dessert from the moment I wake up in the morning. It’s what gets me through the day, really, knowing that I have a treat to enjoy when my work is done. But with these Pineapple Upside-Down Pancakes, I can treat myself to dessert first thing in the morning in breakfast form! That’s one great reason to get out of bed. 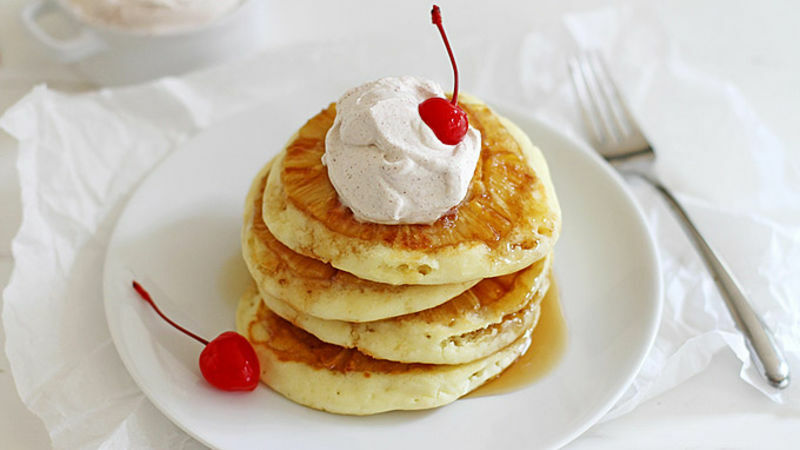 Even though pineapple upside-down pancakes topped with cinnamon whipped cream sound fancy, they’re really simple to make thanks to Bisquick pancake mix. So much yum! 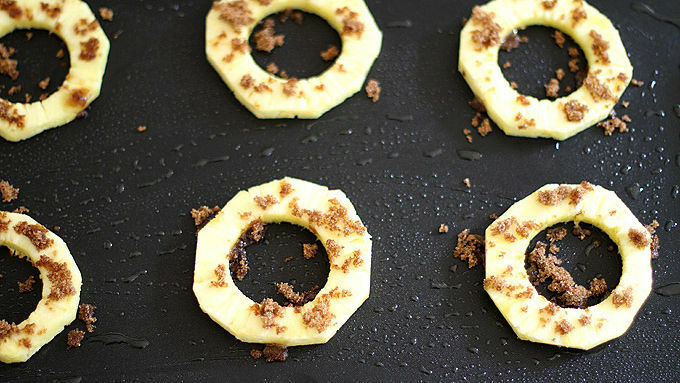 You can either slice a pineapple into rounds and core the centers using a biscuit or cookie cutter, or you can also use canned pineapple rings. Breakfast – and dessert – is served!